At the height of a single carbon atom, graphene capillaries made by an international team of researchers might be the tiniest pipes ever made. The conduits are so narrow that only water molecules – but not even the smallest salt ions – fit through. Scaled up, they might be ideal desalination membranes. ‘We wanted to mimic the size of natural protein channels called aquaporins, which control the movement of water through cell walls,’ says Radha Boya from the University of Manchester, UK, who led the work together with graphene discoverer Andre Geim. Aquaporins’ hourglass shape is, at its narrowest point, only as wide as a single water molecule – meaning they block everything else. But making atomically narrow pipes out of synthetic materials has proved challenging. Geim’s team had previously made 6Å-high capillaries. But many solvated ions are around 7Å in diameter. By simply squeezing their solvation shells, they could pass through the channels without much resistance. ‘We decreased the size by a factor of two and it has become completely impermeable to even the smallest salts – we reached the critical size,’ says Geim. 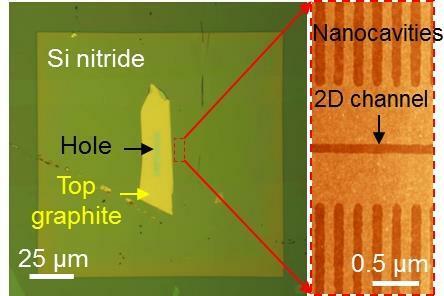 The membrane is made out of several single-layer graphene strips, which act like pillars sandwiched between two atomically smooth graphite or boron nitride crystals. The space between the crystals is therefore the height of a single carbon atom, around 3.4Å. Each capillary is around 130nm wide and several micrometres long. Even small hydrated ions like potassium, sodium or chloride are too big to fit through the channels. Only hydrogen ions (protons) can pass through the membrane – further proof that protons move in a different way to other ions, by hopping from one water molecule to the next. But the material is interesting for another reason: when water is squeezed down to a single atomic layer, ‘some pretty weird stuff goes on’, says Geim. Flat water has ‘a fundamentally different structure to its bulk’, says Boya. It becomes more structured, forming a phase previously described as square ice. It loses its dielectric properties that usually make water such a good solvent and becomes almost non-polarisable. A scaled up version of the membrane could be used for desalination – making drinking water from salty or polluted supplies. ‘The filtration efficiency is higher with size exclusion membranes than with common reverse osmosis membranes [used in most desalination plants],’ explains Boya. But Petr Král, who studies of fluid movement in graphene nanopores at the University of Illinois at Chicago, US, doesn’t think desalination is the most obvious application. ‘In this material, water can’t pass through very fast, it’s too confined, too viscous,’ he says.